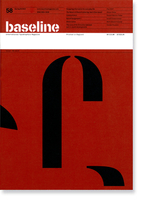 Baseline sets out to reflect all aspects of type, including its design, history, use, and links to the graphic, art and craft scenes. The magazine’s contents are deliberately eclectic. It publishes historical and new material, from academic as well as journalistic sources. This means that the magazine provides a rich mixture of articles and reference materials. The editorial stance is open, valuing especially originality of thought, while giving due weight to academic research. It has a distinct personality, lending emphasis to humanism. It is neither superficial nor artificially analytical. The magazine is highly regarded for it’s use of materials and production values. Baseline’s philosophy is holistic. It stems from a firm belief that design and layout should spring from, and be in balance with, the contents. The design is approached with intellectual vigour. The format and flexible grid structure allow both for the vigorous display of rich graphic material and the appropriate detailing in text-led pages.